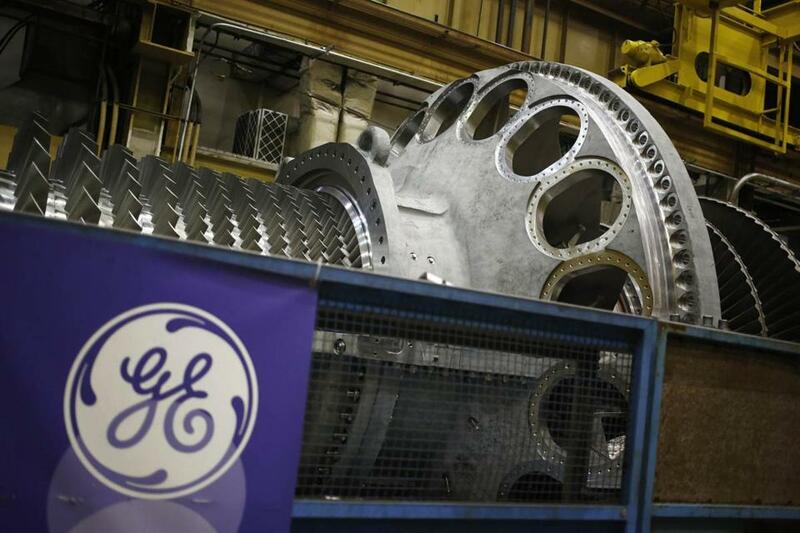 A gas turbine at the General Electric energy plant in Greenville, S.C.
Acrimony over the lockout at National Grid, and safety worries after the Columbia Gas explosions in the Merrimack Valley, have cast the state’s gas utilities under a newly harsh spotlight and raised questions about whether they have any long-term future in a state trying to cut its fossil fuel reliance. Critics have even called for completely halting the expansion of the natural gas network to homes. That’s misguided, and would likely make meeting climate targets harder than necessary by prolonging use of even dirtier fuels that more than a quarter of the state’s homes still use: propane and heating oil. But so is the mindset of the utilities, who tend to view their eventual shift to less carbon-intensive fuel as something that can be left for the distant future while the state focuses on converting oil heat instead. About 18 percent of the state’s greenhouse gas emissions come from residences, according to state statistics, and far more homes heat with gas than with any other fuel. If anything good comes out of the trouble with gas utilities this year, it should be a commitment to move toward a cleaner future now, even as they continue to convert oil-heating homes.It’s unlikely the heavily-regulated utilities will all do so on their own. So while federal officials tackle safety concerns raised by the explosions — there was a US Senate committee hearing in Lawrence on Monday — the state should also be prodding the gas utilities in a greener direction, in the same way the Commonwealth nudged electric utilities to source power from wind and solar generators. There are two currently viable substitutes for conventional natural gas. One is renewable natural gas made from agricultural waste, food scraps, and animal manure, produced at facilities called anaerobic digesters. The other is hydrogen. A utility could steadily reduce its carbon footprint by blending more renewable natural gas and hydrogen over time without customers ever noticing a difference. Not only is it doable — it’s already happening. This year, Vermont Gas began offering customers the option to purchase anywhere from 10 to 100 percent renewable gas; for a typical home, the 10 percent option adds $7.50 a month to gas bills. Beth Parent, a spokeswoman for the utility, said that while only about 50 customers had signed up, that includes major institutions, including a hospital, a food company, and Middlebury College. Meanwhile, in Britain utilities are drawing up plans to blend hydrogen into gas networks or switch them entirely to hydrogen (unlike a blend, an all-hydrogen network would require customers to upgrade their appliances). Hydrogen can be extracted from natural gas, with the carbon pumped back underground, or produced by power plants. Two policies would help kickstart the transition. First, the state could borrow an idea from the electric sector, and set an escalating requirement for renewable natural gas; such a law has been considered in California. Second, it could tighten its current rules against throwing away organic material, so that more food scraps and other waste is available for digesters. The timing is right — and not just because gas utilities are under the microscope. Right now, most digesters in the state burn the gas they produce to generate electricity. But a federal tax credit that supported electric generation from biogas disappeared in 2016, and most businesses seeking to build digesters now hope to upgrade the gas to pipeline quality and then pump it into the gas network, according to Patrick Serfass, the executive director of the American Biogas Council. For instance, in Yarmouth, Genesis Industrial is planning a digester that would turn biosolids — the leftovers from the sewage treatment process — into gas, upgrade the gas to pipeline quality, then feed it into National Grid’s network. Right now, businesses that generate more than a ton of organic waste per week have to divert it from landfills, a requirement that covers large restaurants and food manufacturers. But lowering the threshold to a half-ton would bring more food scraps into the stream. A total ban would do even more: “Residential homes are not required to separate. But as soon as they did that, it would be explosive growth for anaerobic digester need in Massachusetts,” said Scott M. Coulombe, Genesis Industrial’s vice president of business development. In the meantime, though, the state should stick with the policy adopted by former governor Deval Patrick, who signed a law in 2014 that called for accelerating “the expansion of and conversion to natural gas usage in the Commonwealth.” According to the census, 26 percent of Massachusetts homes — 675,000 in total — still use oil, compared to a national average of 4.7 percent. Another 89,000 use propane. As long as those homes have an economic incentive to convert to gas, which shaves about a quarter off greenhouse gas emissions, it’d be foolish to prevent them from taking it. To the consternation of some environmentalists, Governor Charlie Baker has continued Patrick’s natural gas policies, but it’s the right call for now. Critics of natural gas want homes that currently use oil and propane to switch to electric heat instead. Modern high-efficiency heat pumps are a great option for homeowners who can afford installation costs that can run into five figures, depending on a home’s size, and the higher electricity bills. But a state that has some of the nation’s highest retail electricity prices probably shouldn’t build its climate policies around the expectation that customers will choose electric-powered home heating solutions. One of the reasons the state has been able to cut its greenhouse gas emissions from electricity so rapidly — unlike the stubbornly high emissions from transportation and buildings — is precisely because individual consumers haven’t had to do anything, since state laws and economic forces steered generators to cleaner sources. There’s a little-known historic precedent for such a shift at gas utilities. Until the 1950s, gas utilities delivered their customers a half-hydrogen, half-carbon monoxide mix called “town gas,” which was manufactured from coal at gasworks across the state. In the span of about five years, they abandoned them for economic reasons and switched to natural gas instead. The gas utilities were able to pull off a large-scale energy transition once before. They can do it again — and have to, this time for the health of the planet. Gas infrastructure in Mass. : A recipe for disaster?